How are you? I hope all of you are fine. I’m also fine for your blessings. 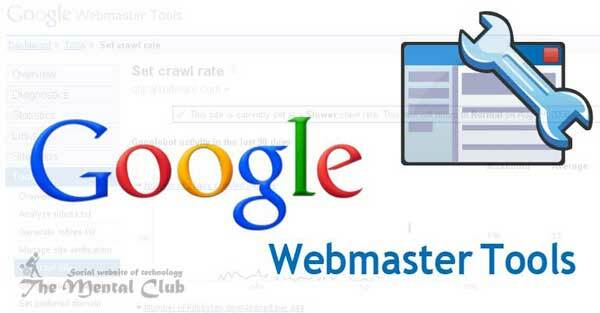 Today I will share with you “How do you add your Website in Google Webmaster Tools and Verify it”. The search engine is the one of the best and main medium of reaching your blog in online to the men of the whole world. The work of SEO is bringing this blog in good position in search engine. If your blog’s link is not indexed correctly, then staying in good position in SERP is very far. 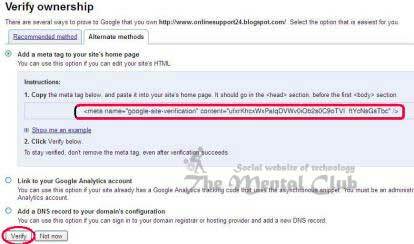 How To Verify Your Website With Google Webmaster Tools? Webmaster is very helpful to index site quickly in search engines. Through which you can submit a sitemap of your site. But it has to keep in mind that the sitemap is a very big factor in SEO. If that would not stay, then search engine like Google, Yahoo and Bing would not give the benefits of webmaster tools. Anyway, today we will discuss about Google webmaster. 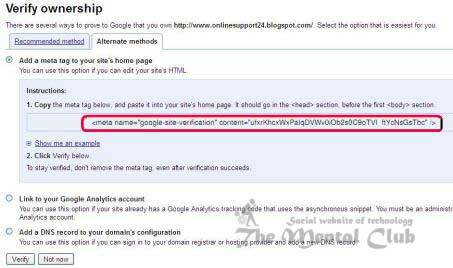 There will be stayed how to add a BlogSpot blog in webmaster including screenshot and you have to add the sitemap. 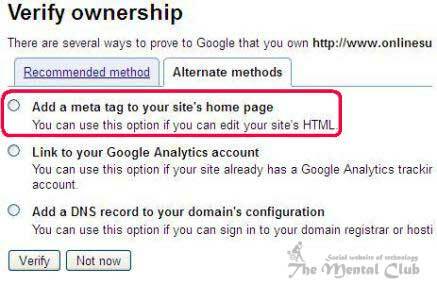 See from here how to submit a sitemap including site or blog in Bing webmaster or Yahoo webmaster. Previous Article: What Is SEO Friendly Meta Tag? The Tutorial Of Learning Meta Tags At Free Of Cost. First, go to Google webmaster central and click in “Sign In to Webmaster Tools”. Now you have to sign in with Gmail ID and then sign in. You entered in Google webmaster then “Add Site” option will come in the following, click here. Click in “Submit” by setting the URL of the site in the box in the following picture. Yes, your site or blog is added in Google. Now one page will come for your site authentication, where you can upload files like Yahoo and Bing webmaster and verify ownership with Meta tag. As we have used webmaster for BlogSpot so we will choice Meta tag. And for that we will click in marked alternative methods in the picture. Now alternative methods will come, from here we click in to add a Meta tag option. 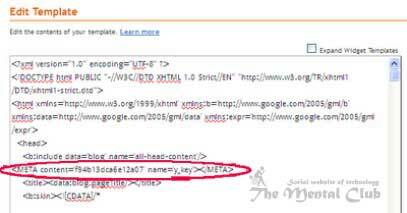 The blogger never gives you the advantage of uploading file, and that’s why you have to choose Meta tag. Even in other cases also you can verify with Meta tag. A pop up page will be opened, including Meta tag and copying Meta tag we will open our BlogSpot in a tab. Now go to Design / Layout of your Desired Blog from Dashboard of BlogSpot (of which blog you are wanting to do webmaster). Now click on Edit HTML. You will see a coding section of the blog. Copied Meta tag from webmaster first head and then paste and click in save template. Like the picture in the following. Coming back in Google webmaster and click in “Verify” like the picture in the following. You can add your site in root directory directly if you want, or you can add WordPress in Meta tag of website if you want. The easy way is giving verify tag in the Meta tag. After adding tag you can click on verify. Now verifying is finished. If verify is done correctly then it will come in that site dashboard. Now we have to submit a sitemap. 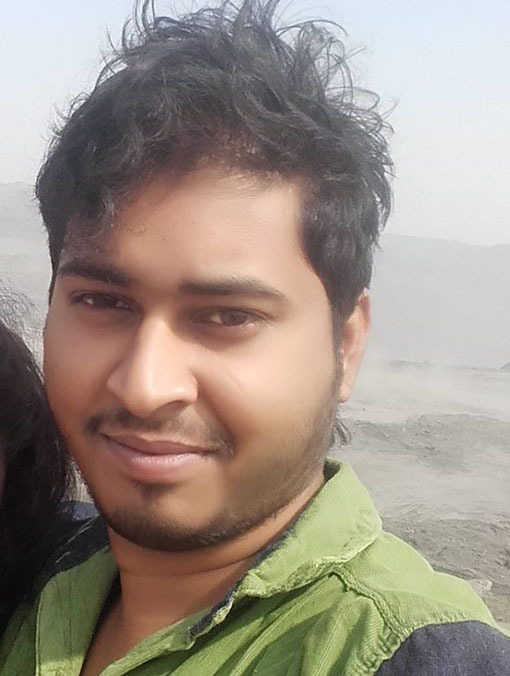 (There will be discussed about sitemap details in the next post). There is an option of sitemap in right side in the following of dashboard and click in “Add Sitemap” there. The meaningful language of analytics word is a statistic or observation. Analytics on the web is observing hit of different web link. Suppose you kept any software’s download link in your server. How many persons have downloaded and when? The statistics on the list where how much persons have downloaded in which day that is called analytics. Why will you do analytics? You made a site by working hard. That has become so popular. Now some visitors come into your site daily. Analytics is very essential for knowing all this which writing they have liked. And writing any theme and searching for a search engine on your site how much time visitors have stayed. For knowing etc. It is used. If you use then writing articles in that keyword, you can make your site very popular.